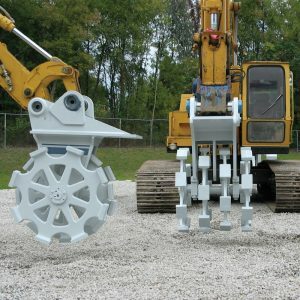 Compaction of large lift and constant boom down pressure all take their toll on standard static compaction wheels. Cast manganese steel wheels & super strong one-piece construction from cast manganese steel no welds to fatigue and break. This is the ultimate working steel, the more you work it, the harder it becomes. The surface is extremely wear-resistant yet the center is strong and ductile. The wheels are securely mounted to the hardened shaft using a split tapered bushing, allowing the wheels to be removed for ease of maintenance. Sealed high-strength composite bearings. The composite bearings are capable of carrying extremely high loads and are far less susceptible to contamination than ball or roller bearings. The bearings are completely sealed keeping dirt and debris out. Unique bearing housing protects the seals from direct exposure to the harsh working environment extending service life. Floating Top-Mount Boss Our floating boss mounting system incorporates standard mounting hardware while meeting OEM Pin Centers for specific carrier mounting. This eliminates the long delays associated with OEM specific top caps. Maintenance Split tapered bushings are used on the wheels for easy disassembly. Grease fittings are located at the shaft ends for quick lubrication.